← Endangered Kirtland’s Warbler Recovery: What Now? 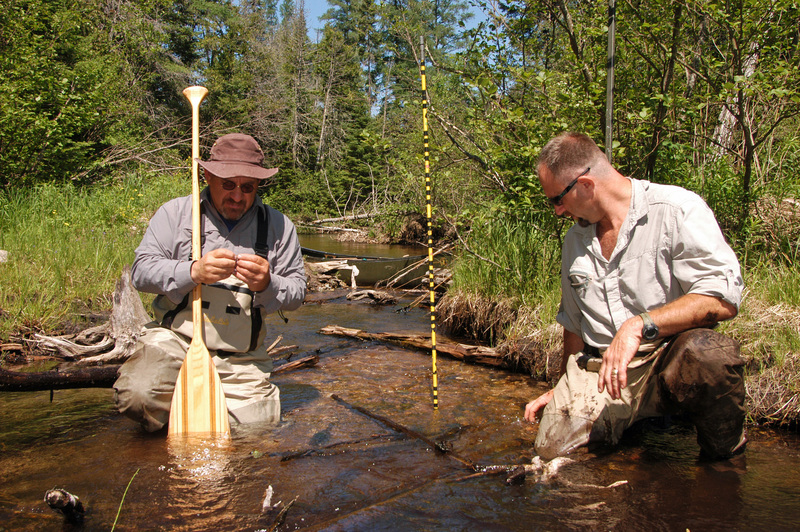 While picking through the natural debris on the bottom of Grasshopper Creek, a tiny stream feeding the upper Boardman River, two scientists with the Grand Traverse Band of Ottawa and Chippewa Indians began to get excited. Brett Fessell and Frank Dituri both noted things that made them hopeful. Fessell is the tribe’s fish and wildlife coordinator. Dituri is their wetland ecologist. He is also chairman of the multi-jurisdiction implementation team guiding the Boardman River restoration. The multi-million dollar project involves removing three dams and modifying a fourth over the next several years. Brown Bridge Dam, most upstream, was the first to go in 2013. 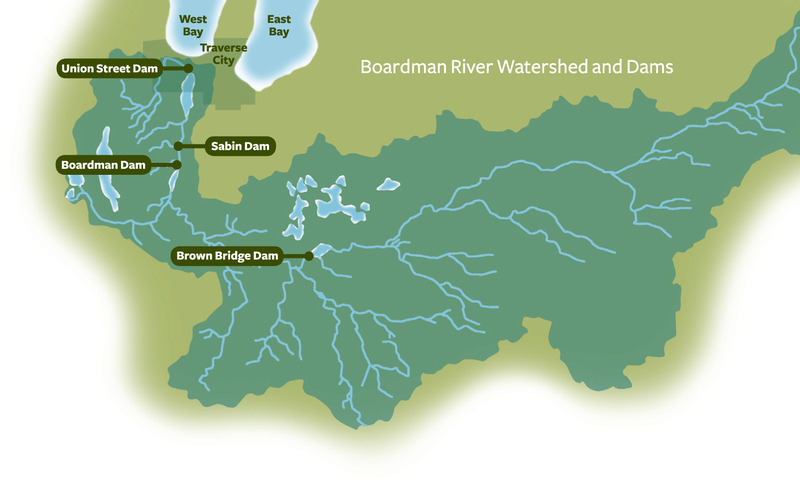 Source: The Boardman River Dams Project. The three of us were canoeing though the 2.8 mile restoration area, the zone that was underwater prior to removing the dam. The former pond and backwaters, where paddling was once slow and laborious, had reverted to being a quick-moving river – today a joy to paddle. What these scientists had discovered in streambed, set in a wild tangle of forest, were the empty cases of caddisfly larvae that had emerged, tiny conical structures made of fine gravel, found only in running water. Trout food, essentially; at very least, an indication of bugs that trout love. “This place (the creek bottom) was all filled with mud,” Fessell explained, admiring the fresh gravel bed that was uncovered once the muck washed out, pushed by faster stream velocities made possible after pond waters went down. Dituri was enthusiastic. He is one of many implementation team members who are monitoring the process, a group including representatives from the Michigan DNR, U.S. Fish and Wildlife Service, City of Traverse City, Grand Traverse County, Traverse City Light and Power, and Michigan Hydro Relicensing Coalition. What is true on Grasshopper Creek is also true on the Boardman River. More gravel now shows along the river bottom above the former dam site – providing more habitats for spawning trout. The river flows faster. Silt, sand and sediment are flushed downstream more readily. 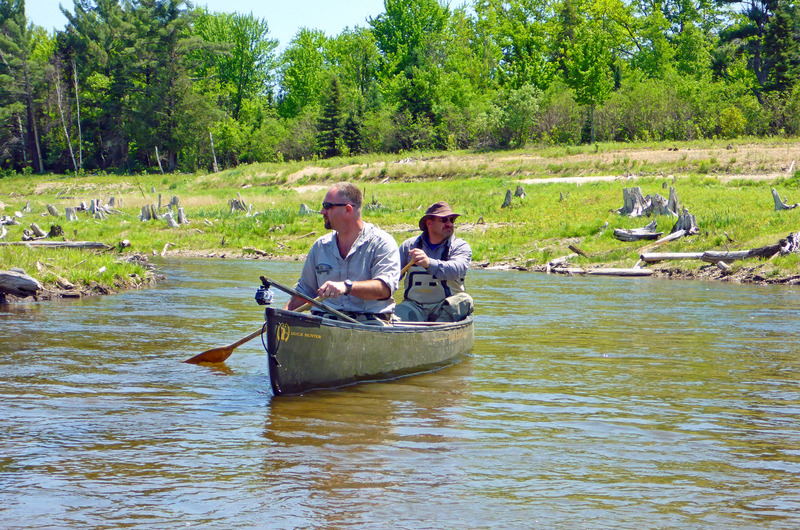 We floated on, further down river, into the flood plain exposed by draining the pond – a wide-open landscape littered with thousands of bleached-out stumps that offer a compelling look at Michigan history, to an era before the dam when rapacious loggers cut everything in sight. appears all around the stumps at river level, a far different picture than the black muck shown in photos last year right after the dam was removed. Some of the vegetation is natural. Most of it, Dituri explains, is enhanced by native seeds and trees that have been planted as part of the restoration. In the distance I see tall poplar stands, the product of last year’s plantings. They are twice the height of those planted this year. Restoration crews have planted 1,700 trees so far this year, a mix tamarack, cedar and red oak, among others, Dituri said. There and then I vowed silently to return, to paddle the river each year and witness the ongoing recovery. To see it is to believe, someone once said. And what I saw gave me hope for the rest of the Boardman River as well. This entry was posted in Uncategorized and tagged Boardman River, Brown Bridge Dam, Conservation, Dams, Environment, Fishing, Grand Traverse Band of Chippewa and Ottawa Indians, Nature, River Restoration, Rivers, Traverse City, Trout. Bookmark the permalink. Great success story! Wish we’d remove some of our damns here in NB. I was planning on heading up to Traverse City next month. Guess I’ll have to take the kayak’s along. mfs686…do take it – you won’t regret it.